With the elections underway I was already focusing on being more alert for potential threats. For the foreseeable future my little Ruger LCR will be relegated to the safe. Replaced by something with a little more capacity and quicker reloads. I also plan to review my EDC gear and see if anything in there needs to be beefed up. 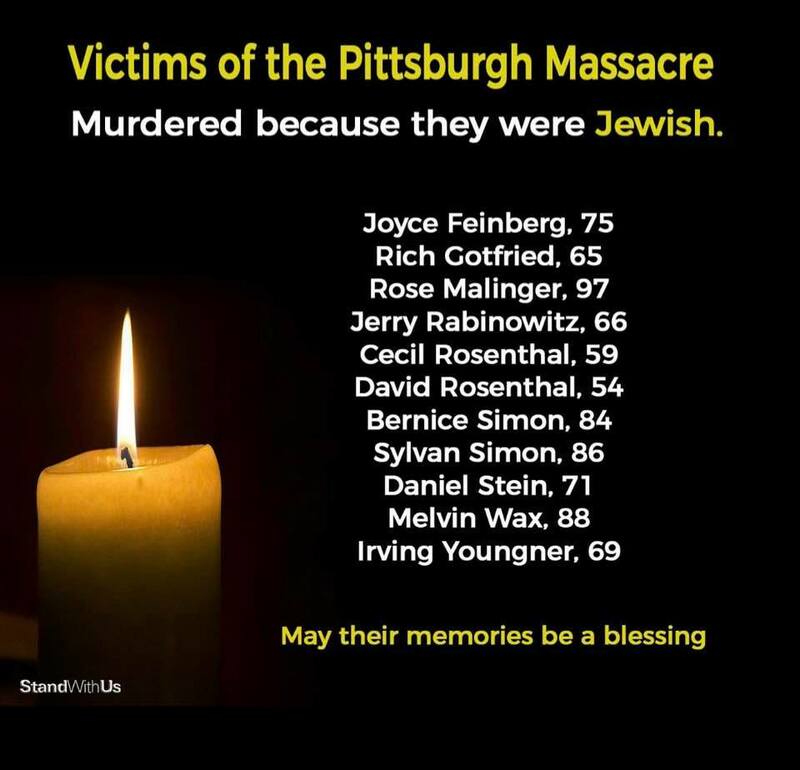 The attack on the Tree of Life Synagogue in Pittsburgh further strengthened my push to reevaluate my EDC. Well, the little Ruger is still in my pocket and not in the safe. I was planning to switch to my Glock 43 as my primary carry gun but for now I am staying with the LCR. Although reloads are definitely faster than with the LCR, the G43 only gives me two extra rounds on tap (6+1 vs. 5). Are those two extra rounds (and faster reloads) worth giving up the slightly better reliability of the revolver? Not at the moment. I might do so later but for the moment I have decided to stick with what I have carried for the last year or two. I am familiar with it. I am well practiced with it and all the gear that goes along with it. That may change in the future but for now I will stick with what I know. Based onsome additional research I have been doing especially some articles by Greg Ellifritz (this being a good overview: Post Election Riots?) I have changed up some of the other gear I carry. I have had a tourniquet sitting on my desk for a year waiting on the time to take some training before carrying it. It is now in my pack and online training will have to do for the moment. Pepper spray? Yup added on the outside of my bag. Knife? 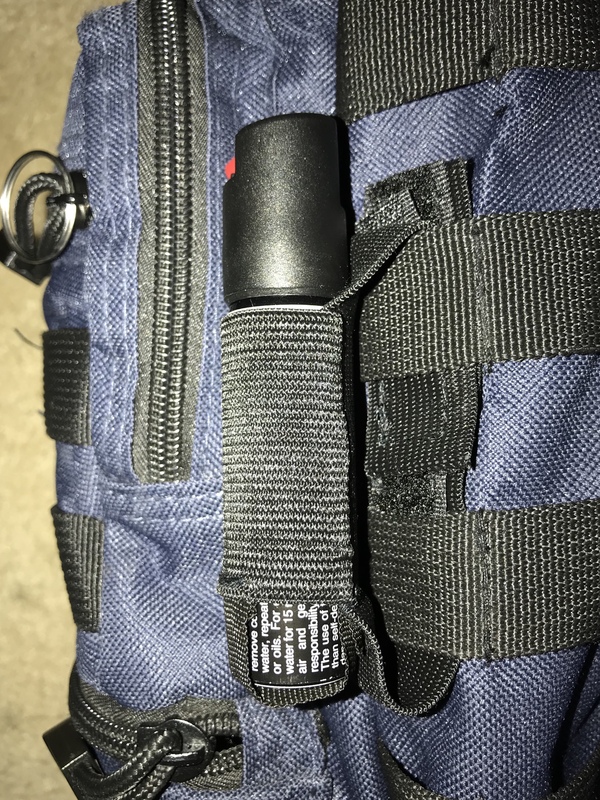 Moved from inside the back to a spot where it is more easily reached and deployed (this is in addition to the one I usually carry in my pocket or on my belt. I will be adding an additional bandana and a bottle of water to my pack as well. Which means I may have to start carrying a small backpack instead of the sling bag I carry now. I will continue to reevaluate my carry gear until thigs start to subside…if they ever do. Keep alert, be prepared and take care. Last week I talked about the increasing possibility of violence in the US. I have to wonder if both sides would be as worked up if the bombs had been targeted towards non-politicians? No one on the left was worked up when an Antifa mob attacked an elderly driver who just wanted to get where he was going. I purchased the Smith & Wesson Model 69 (The Hammer) the other day to be by sidearm when hunting and engaging in other outdoor activities where I might encounter a serious threat from the wildlife. Unfortunately, life, the universe and poor planning on my part have put me in a position where The Hammer will stay home for my fist hunt of the season. With my current workload (personal, business and spiritual) I did not have enough time to order the ammo I want to use. Few local gun stores carry .44 Magnum and almost none carry .44 Special. I could get a decent .44 Magnum load but no shot shells locally. So it would have to be an Internet purchase and there is no time left for that. Even worse I haven’t found a good carry holster for this monster locally so that will have to be an internet purchase as well and, again, no time. Instead of The Hammer, my Smith & Wesson 340 will get the call. 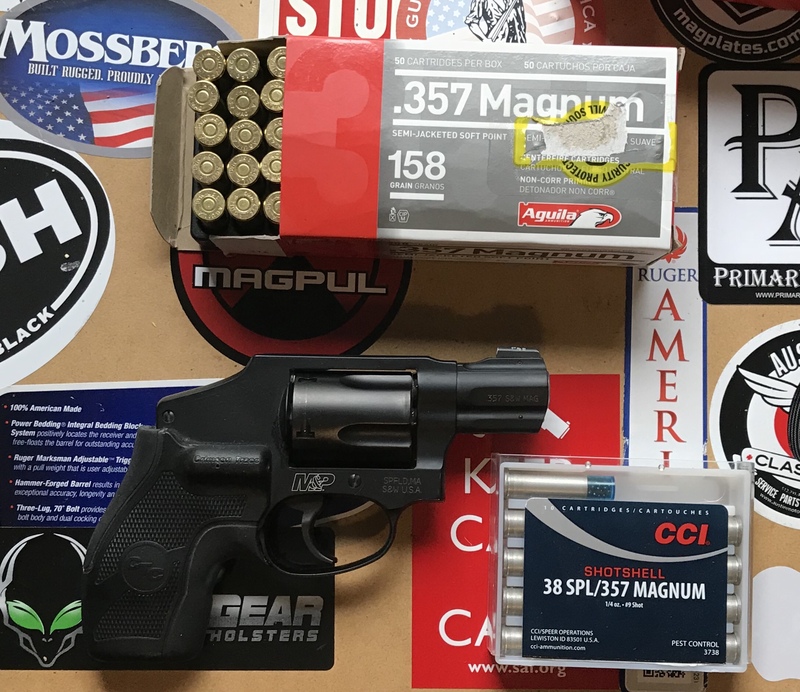 I already have shot shells in .38 caliber on hand and .357 Magnum is a bit more common down here so I was able to grab a box of 158 grain soft-points that ought to suffice against all but the biggest and most determined critters. I also carry this revolver regularly and have several holsters that work quite well already. We are heading out after deer and the area we will be hunting does not have anywhere near the feral hog population that we have down here in Texas. We will not be near any alligator infested waterways either. On the other hand, there is a slightly higher likelihood of encountering black bears in the area and we will be bow hunting so I won’t have a long gun with me. All in all, I have no doubt that the .357 Magnum should be just fine. It is significantly lighter and easier to conceal for travel through populated areas. I was just hoping to be able to bring The Hammer along. Made it back to Sunday school this week which was a positive. On the down side I really didn’t spend much time at all in prayer or studying the Bible. A few weeks back I bought a “Tactical Pen” to carry in non-permissive environments. While on my way to board a plane for a business trip last week I discovered that I had left it in my other bag by mistake. So, as I went from meeting to meeting in and around New Orleans (one of my least favorite places to be disarmed) I basically had nothing to defend myself with. To make sure this didn’t happen again I went ahead and purchased another “TactiPen” so I can have one in each bag and won’t end up in quite that situation again. 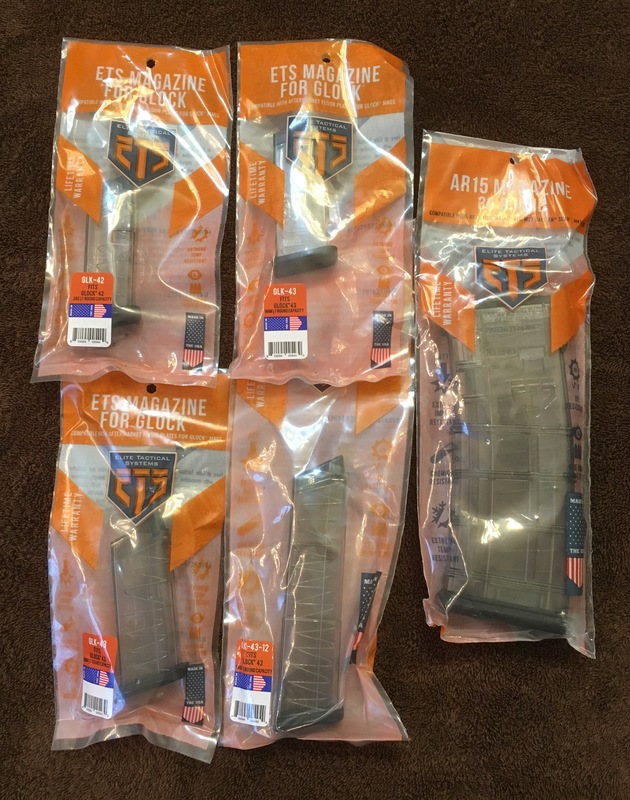 ETS has been getting a lot of press lately for their magazines and a buddy told me that they had released a line of magazines for the Glock 42 and 43. They are polymer magazines and offer an extra round of capacity over the standard Glock magazines. They also have a +6 magazine that is most definitely not flush fitting but I had to order one anyway! I decided to go ahead and try one of their AR magazines too since I was already placing an order. I de-primed and cleaned the brass from my last range session. I like to have the brass prepped and ready to go then I can reload it when I get around to it and the brass is ready to go. When we started our little garden last year I decided to use stakes for growing tomatoes. They seem to work reasonably well on varieties of tomatoes that don’e grow too tall and produce fairly small fruit like cherry tomatoes. For the larger plants and varieties we are growing this year they don’t seem to work all that well so I broke down and purchased the wire cages for all my tomato plants and even a few of my pepper plants. Wonderful Wife had already done so on her one tomato plant that she has on the back porch and it has worked well for her so, hopefully, this will help the plants in the garden produce better and be a little more hardy as well. With hurricane season kicking in we rotated food out of the emergency pantry and into the regular pantry and then put a list together to replenish what we need. We received another shipment of freeze dried foods this month and I have been very pleased so far…I really need to do a post on it…. Yes, I carry a knife almost every day. Yes, I have a nice collection of knives of various sorts. Yes, I love checking out cool new knives. But to me, knives are just tools. Tools that are to be used, regularly, for whatever I need to use them for. Most of the time that involves cutting something whether that is opening boxes and packages, trimming plants, opening the mail, or preparing food. 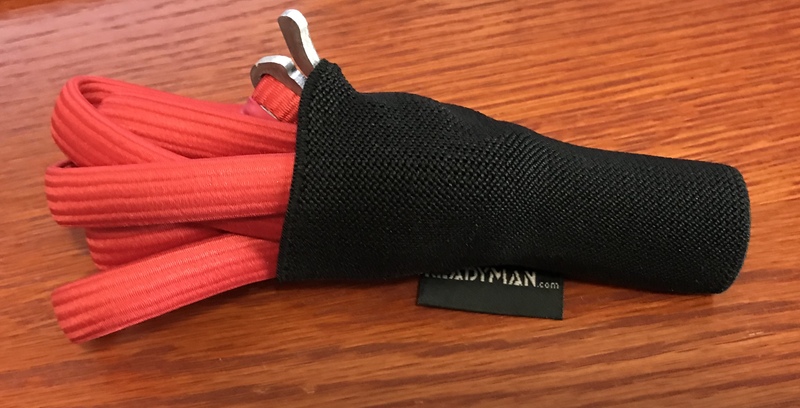 They also get used for any sort of other purpose that may come up; pry bar, hammer, screwdriver, or even for self-defense should the need arise. They are cheap, easy to use, easy to carry, easy to use and result in a serviceable edge. For a big chunk of my adult life a cheap single-bladed Barlow picked up on a whim accompanied me every day, generally in a pocket with keys or in the coin pocket of my jeans. It did everything I needed it to for years and cost less than $10 at a small town WalMart. Eventually, the blade snapped off (completely this time) and I went looking for a replacement. Knives like this are apparently no longer in favor with most folks and the ones I could find were either super cheap knives made in Pakistan that I wouldn’t trust for anything other than being a display or really nice, really high end knives. After trying quite a few different knives and styles I finally found the STL 2.5 from Gerber. I picked one up from a large sporting goods retailers based on how thin and light it was. I worked in an office that was non-permissive when it came to “weapons” and I wanted something as thin and light as possible to carry in my pocket. That was at least five or six five years ago and I have been carrying it ever since on an almost daily basis. Despite being a pretty simple, and cheap knife it just works and, more importantly, lasts. Despite being used and abused in a high humidity and somewhat corrosive environment (lots of saltwater on the Texas Gulf Coast) it hasn’t rusted. The black finish is a bit worn in areas mostly from living in a pocket with keys and other random items but the finish is unbelievably tough for the price. 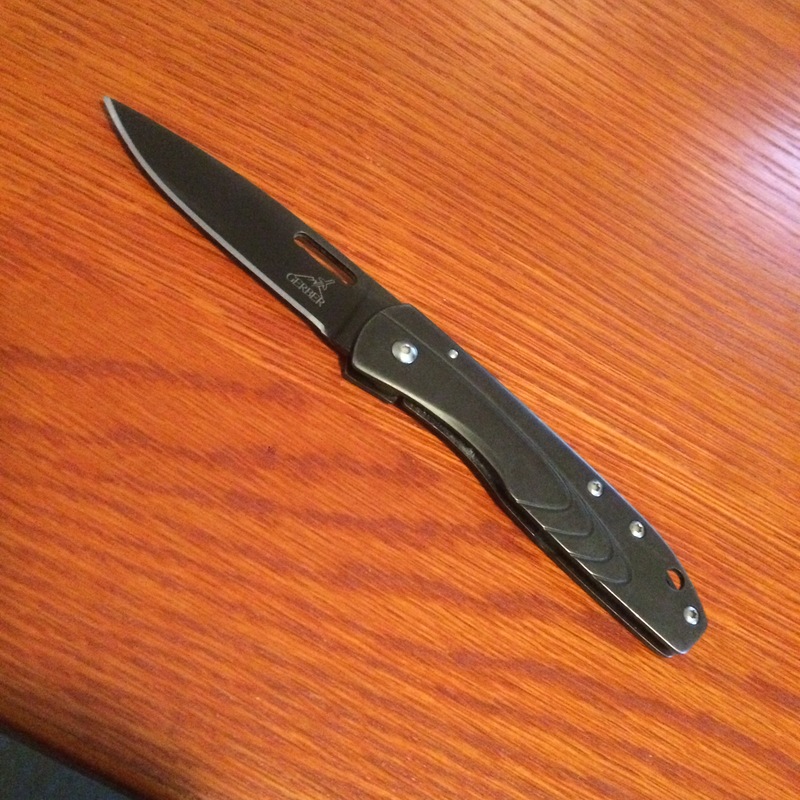 I like this little knife so much I bought a spare for when I lose or finally destroy this one. I have tried several different knives during the time I have carried the STL but none have been able to replace it on a daily basis. 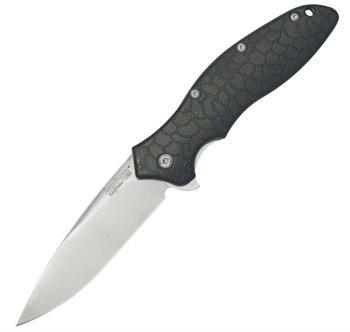 The Kershaw 1830 OSO SWEET has come about as close as any. The 1830 is a little too big and bulky to carry in most office settings or when wearing nicer clothes but it has replaced the STL outside of those situations. The blade is about a half inch longer and a good bit thicker. The profile of the blade makes it a lot stronger than the STL but it still holds a nice edge. The only complaint that I have is that the un-coated 8Cr13MoV steel stains easily. I haven’t seen any rust but it has picked up discolorations from several tasks including cutting steak and potatoes for a camp dinner one night. Based on my experiences with this Kershaw I tried the 3840 Freefall. It was a bit bigger and heavier knife but seemed to be a good choice for a more “survival” oriented knife plus the blade is coated with a “stone washed” finish that I thought might prove more stain resistant. Unfortunately, the finish on the blade does seem to stain pretty easily compared to my cheap little Gerber and, to be honest, the extra weight and bulk has been tough to get used to. It get’s left behind most of the time. That’s my knive’s tale. What’s yours? This was, overall, a good exercise. Even after spending several hours digging through and organizing my stuff I honestly didn’t change much but what I did change is good. As a personal exercise, this really was a pretty good investment of my time. 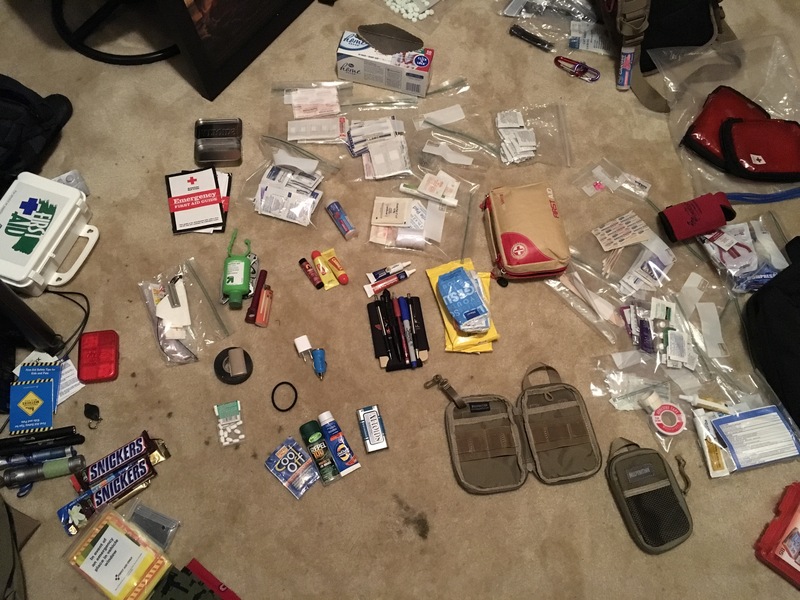 I found some items that were either expired or ruined, tons of duplication in what I was carrying and I reorganized all my first aid supplies. It is not perfect, it is not as light or small as I would like but it works and it has what I consider to be my “critical items” and a few that are not so critical but it works. 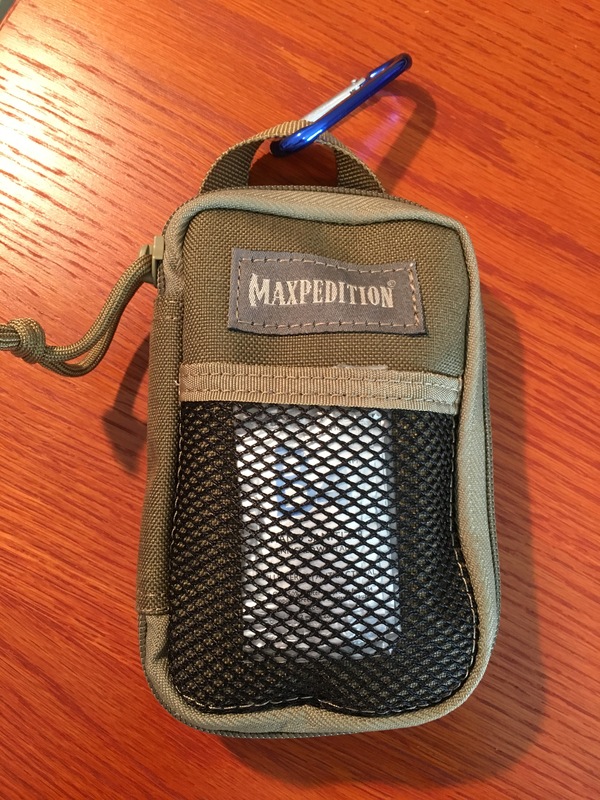 It is nowhere near what I would call “micro” but this little pouch/bag/organizer does fit in any of the cargo pockets I have tested it in. It is a little heavy but I should be just a matter of getting used to it being there as I have with my gun, knife, etc. I added a small carabiner clip which allows me to attach it to a belt loop or another bag. I can also just toss it into another larger bag. The front pocket holds a few packets of hand sanitizer. Opening it up I have a small tube of lip balm, a little container of over the counter pain relievers (acetaminophen, ibuprofen and naproxen), flashlight, over the counter antacid (rantidine), and the first truly critical item Benadryl (diphenhydramine). Wonderful wife has a sever food allergy that we have, as yet, been able to identify. One of these as soon as the symptoms start to show saves a trip to the emergency room (or worse). In the pocket to the left I have a few first aid items to treat (very) minor injuries; antiseptic wipes, band-aid, bandage, antibiotic ointment and eye drops. 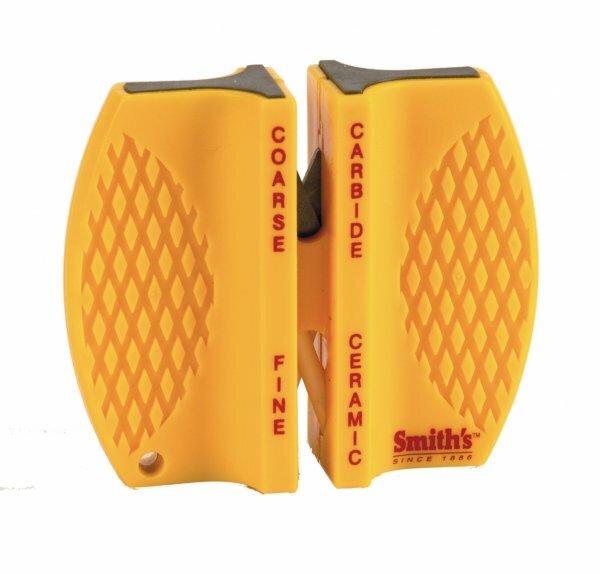 I won’t be able to deal with any serious injuries but it is small and light enough to carry and will help when the grand kids (or Pappa) get a little injury. 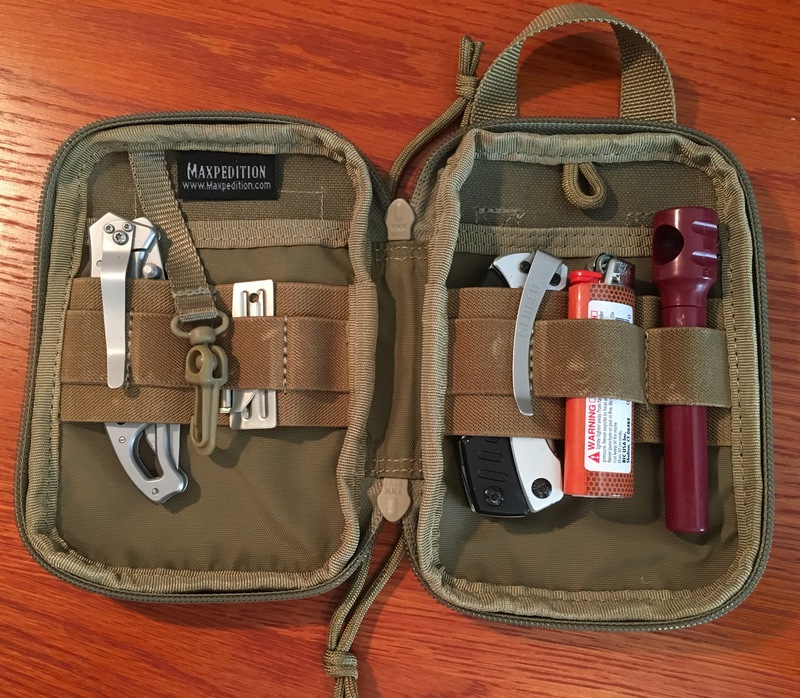 I plan on adding a few more items as there is plenty more room in the pocket. I keep all of it in a sealed plastic bag to make it easier to get in and out and to help keep the antiseptic wipes from drying out. 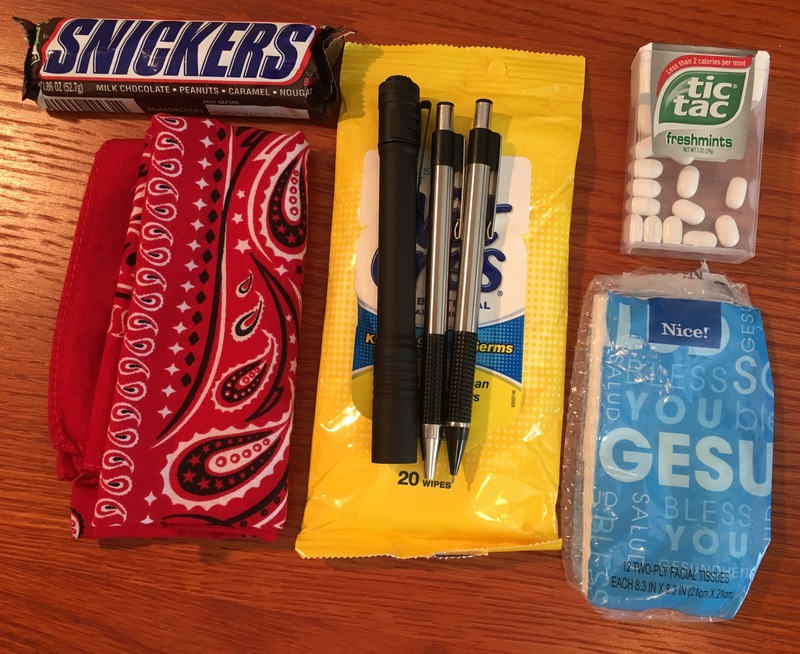 The right hand pocket contains a surgical mask (thanks thoughtfullyprepping for the suggestion) and glucose tablets. Both of these items could be considered “critical.” I have issues with my blood sugar and the glucose tabs can help keep my going until I can get some real food in me. 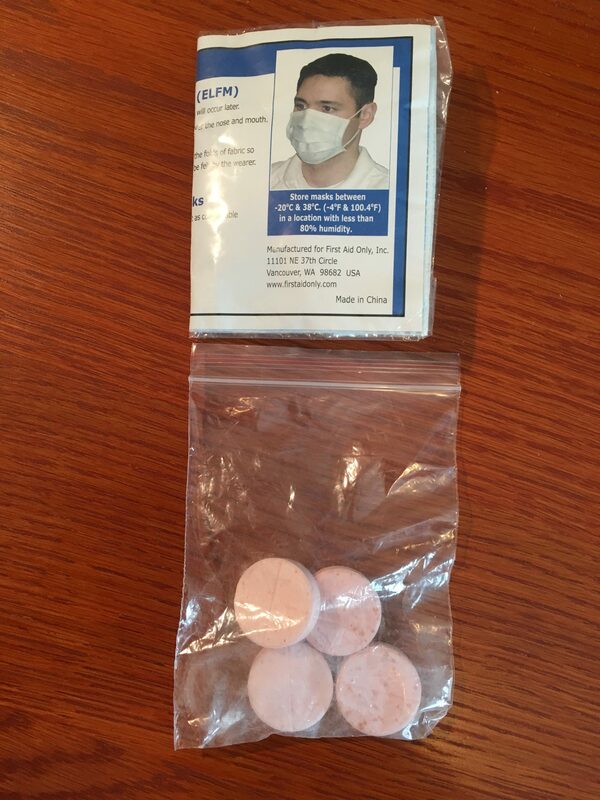 The surgical mask can help protect against airborne toxins and contaminants. I plan to upgrade to a better mask shortly and to include a second mask as well. Everything in here is TSA (and other restricted environments) safe and can be easily pocketed or carried with most of my clothes. It has just the basics and some critical items so it is not too bulky or heavy. Starting out, I had visions of several small packs that could be combined and recombined as needed depending on what was going on and where I would be. That was probably just a little bout of OCD and I got over that quickly. 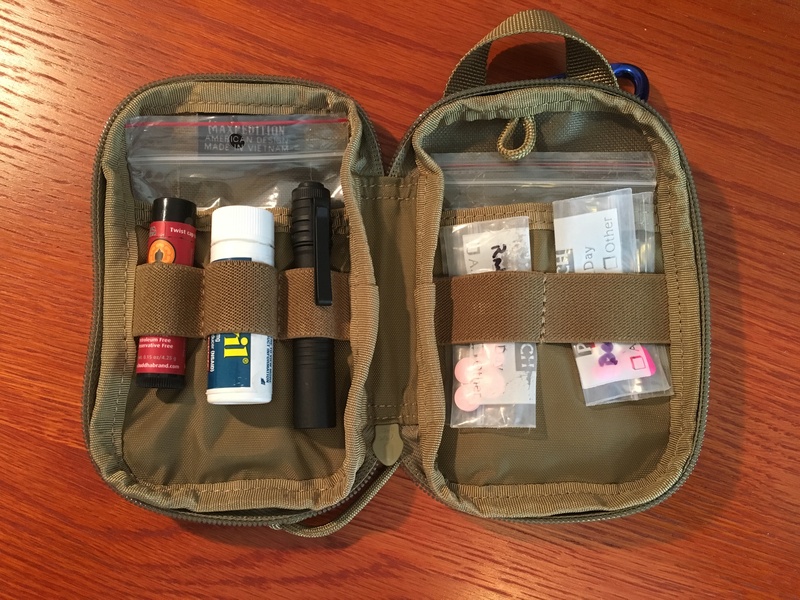 I did however combine all my TSA unfriendly stuff into one of the organizers I bought. That way I know quickly and completely that I am safe for airport travel and I can also tell at a glance that I have restored it when I am done. I will probably change out the knife for a better one shortly. The rest will stay. This part worked pretty well. Other that work related items I only have a few things in my work bag. Gone is almost all the stuff that is in my EDC bag and the only items left are things that make sense. Yes, everything here duplicates what I have in my EDC bag but this is WAAAYYY less that what was there before. By cleaning out my laptop bag of the duplicate items I can fit the entire EDC bag into it if I need to. 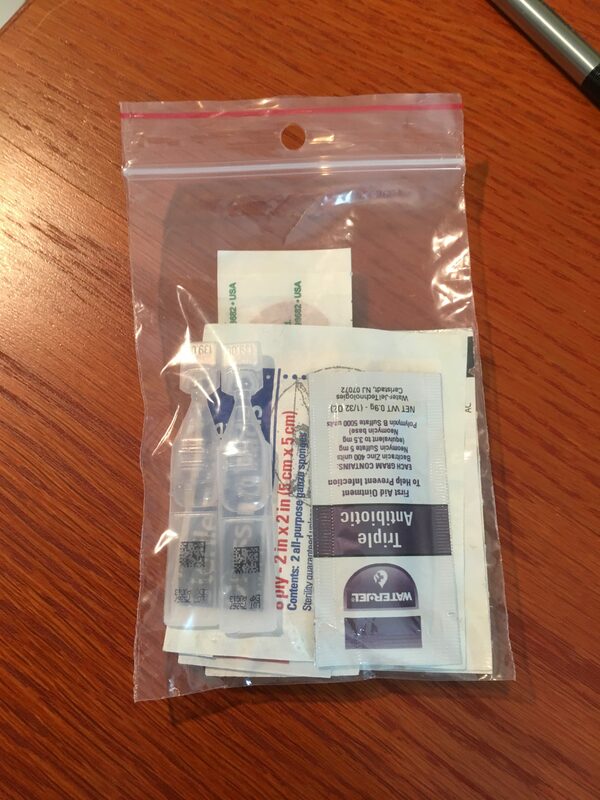 The “critical items” bag can be tossed in or kept in a pocket. All in all I am pretty please with the (small) changes I have made. I think it will go a long way to making sure I have what I need, when I need it and that it is still usable. My walk with God is still going well. We went to church and Sunday school on Easter. It was a great and uplifting service. Our Wednesday night Bible study resumed this week after the break for Easter and, as always, I learned a lot. I was not 100% on my prayer time and personal Bible study. Work and laziness provided excuses to skip a day but I was able to pick it back up again and finish the week strong. I bought a “lead sled” be Caldwell to help me sight in my rifles. I still haven’t made it out to the range but I was able to make short work of laser bore-sighting a couple of rifles out to 24 yards in my backyard. I reorganized my EDC. I’ll post the details later in the week. My blood pressure is almost back to “normal” and the secondary infection I picked up is healing so I should be fit shortly. My strength and stamina are still not back to where I was before we got sick but it is moving in the right direction. I did my stretches every day this week and only missed one day of exercise. I was also able to increase the number of reps I do this week. Wonder Wife wants to join a gym so we signed up for trial memberships at a small place around the corner. I hate exercising in those laces but Wonderful Wife thinks it will help her so I’ll go along to help support her efforts to get in shape. One of the stocks we own paid a dividend and we requested a check for them. I plan on reinvesting the money in something more stable than the stock market or making a contribution to our IRA.